Now is a perfect time to look outside in the evening and learn a playful phrase useful to skywatchers. Scouts learn it. Grandparents teach it to kids. It was one of the first sky tools I learned to use in astronomy. Once you can see the Big Dipper, notice that it has two parts: a bowl and a handle. Then, with your mind’s eye, draw an imaginary line following the curve in the Dipper’s handle until you come to a bright orange star. 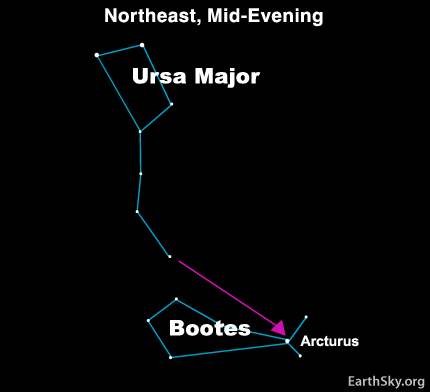 This star is Arcturus in the constellation Bootes the Herdsman. Arcturus is known in skylore as the Bear Guard. Arcturus is a giant star with an estimated distance of 37 light-years. 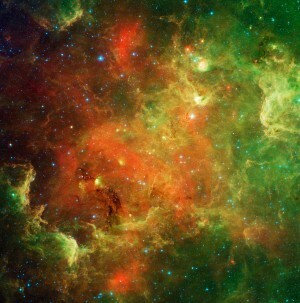 It is special because it is not moving with the general stream of stars in the flat disk of the Milky Way galaxy. Instead, Arcturus is cutting perpendicularly through the galaxy’s disk at a tremendous rate of speed . . . some 150 kilometers per second. Millions of years from now this star will be lost from the view of any future inhabitants of Earth, or at least those who are earthbound and looking with the eye alone.